The Guardian Teacher Network has published a feature on the design of school library spaces in the digital information age, where books and technology meet. 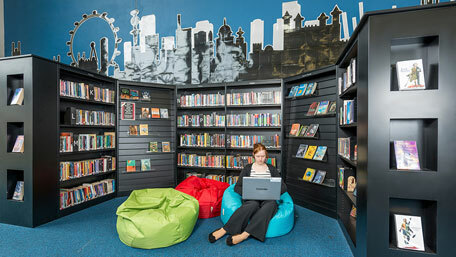 The flexible use of space follows the learning commons model of higher education. "Only three pieces of equipment in the library are fixed, and these are for searching the catalogue. All other computers are laptops, with seating and tables equally moveable to allow the space to be used for exhibitions of pupils’ work or curriculum-linked displays, debates, presentations and even a jazz band." Flexibility, interaction, discovery are all components of a more innovative use of libraries as learning spaces, explored here with a number of examples from both primary and secondary schools. The feature provides a link to a gallery of new and recent library interiors, making it a very useful survey of current school library design practice. Feature and gallery on the Guardian Teacher Network.